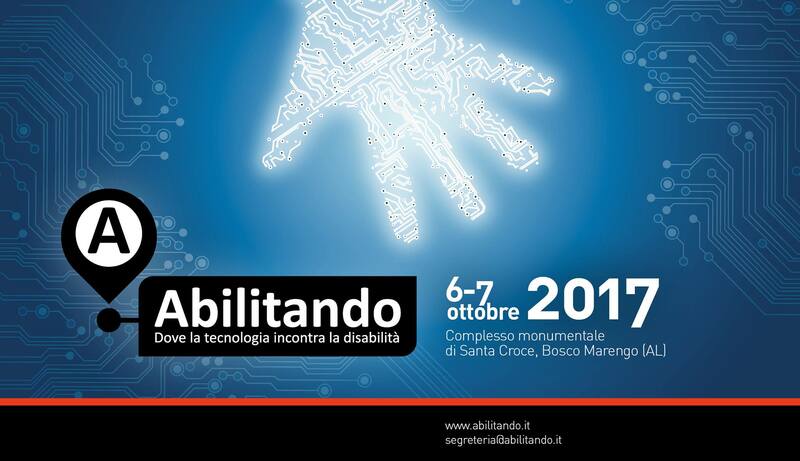 Nei giorni 6 e 7 ottobre, presso il Complesso monumentale di Santa Croce di Bosco Marengo (AL) si terrà la seconda edizione, ampliata e potenziata dell'evento "Abilitando" - "Dove la tecnologia incontra la disabilità". Al fitto programma delle due giornate, che comprendono convegni, aree espositive ed eventi esperienziali, parteciperà anche Fulvio Corno, con un intervento su tecnologie e disabilità durante il convegno di apertura. 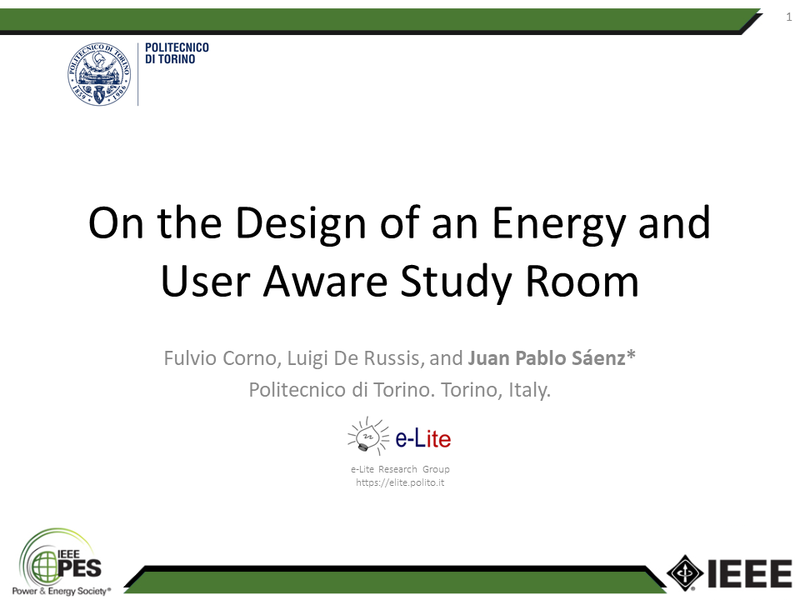 Presentation: "On the Design of an Energy and User Aware Study Room"
On September 28, 2017, Juan Pablo Sáenz presented the paper On the Design of an Energy and User Aware Study Room at the audience of the 7th IEEE International Conference on Innovative Smart Grid Technologies, held in Torino, Italy. 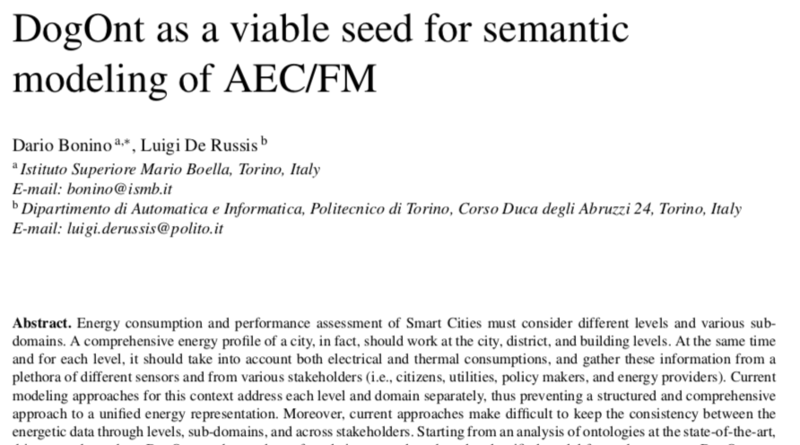 The Semantic Web journal recently accepted for publication the paper entitled "DogOnt as a viable seed for semantic modeling of AEC/FM". The paper has been written by Dario Bonino (a former e-Lite group member) and Luigi De Russis. The manuscript presents the latest version of the DogOnt ontology and shows how the ontology can be used as a foundation towards a shared and unified model for the energy profile of a Smart City. To do so, the paper analyzes serveral ontologies at the state-of-the-art and demonstrates the integration of some of those ontologies within DogOnt. DogOnt was firstly developed in 2008 and withstands over 8 years of usage without major failures and shortcomings; its successful design choices and adaptations kept the model up-to-date and increasingly adopted in several domains, energy representation included. The e-Lite Research Group will participate in the 7th IEEE International Conference on Innovative Smart Grid Technologies (ISGT Europe 2017), at the Politecnico di Torino, in Turin, Italy, on September 26-29, 2017. Juan Pablo Sáenz will attend the conference and present the paper entitled On the Design of an Energy and User Aware Study Room in the session named ICT for Smart Grids. The paper presentation is scheduled on Thursday 28 September, from 16:30 pm to 18:30 pm, in Room 5. The paper identifies the requirements and proposes the design of a two-way aware study room in which users are also aware of the building issues and are enabled to provide feedback by reporting them and requesting assistance. The aim of such study room is to decrease energy consumption, increase the availability of the physical resources, and raise the comfort level of the users. The elicitation of the requirements and the design of the study room were defined based on the results of a survey conducted among 61 university students that use a specific study room located at the Politecnico di Torino campus. Several years ago, the members of the e-Lite research group started to video-record their lectures and seminars. Video recording lectures is both useful for students and for teachers, and the Politecnico di Torino officially records various courses, in its bachelor and master degrees. The e-Lite group holds some of these courses, and records almost all the other courses its members held. Up to now, videolectures were available on official channels (e.g., on the Politecnico website) and as dedicated YouTube playlists (e.g., the "Tecniche di Programmazione" playlist). To ease the discovery of such videolectures and to have a unique place for accessing them, we added the Videolecture category to our website. The category contains all the 2017 courses held by e-Lite group members that are video recorded, either autonomously or officially (i.e., with professional equipment). We plan to update that page in the forthcoming months and years with newer contents. Sustainability of a university campus, and in particular energetic sustainability, relies on the efficiency and smartness of the energy systems, as well as the behavior of campus users (student, faculty, staff). Much literature is available about the solutions for creating smart buildings, and improving energy efficiency and co-generation. Likewise, social studies of behavior in smart homes and cities are also available, but the two aspects have seldom been considered jointly. The thesis of Roberto Marturano, discussed on July 2017, explores this topic and develops an integrated system for a study room in our university. The Smart Study Room (S3) system is able to gather information from various building-related sensors and from crowd sensors, and apply data fusion to construct a comprehensive vision of what happens in a study room. Such knowledge can be used to provide, with a Living Lab methodology, selected information back to the system users, in order to (a) improve their awareness and (b) stimulate behavioral changes. 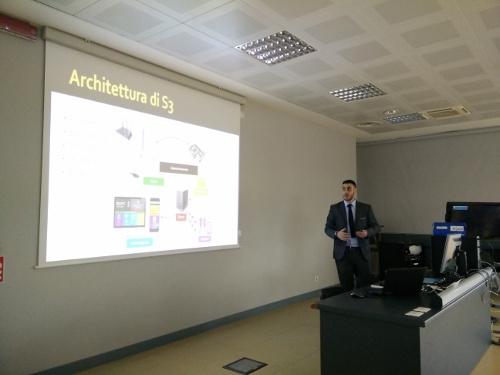 The S3 system has been evaluated through a prototype implementation and the installation in some actual space within the campus, namely a laboratory (before) and the meeting room in which Roberto discussed his thesis. In this way, a complete - yet preliminary - evaluation of the system and of the conveied information has been conducted, with appreciable results.